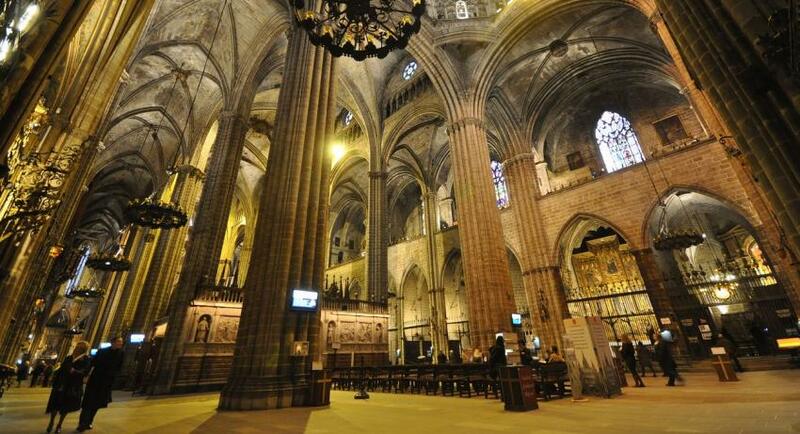 Barcelona’s huge Gothic cathedral, La Seu, is the third church to stand on the site. The 4th-century original (partly visible in the Museu d’Història de la Ciutat) was flattened in Al-Mansur’s raid in 985; of the second, a Romanesque church built from 1046 to 1058 by Ramón Berenguer I, only a doorway remains. 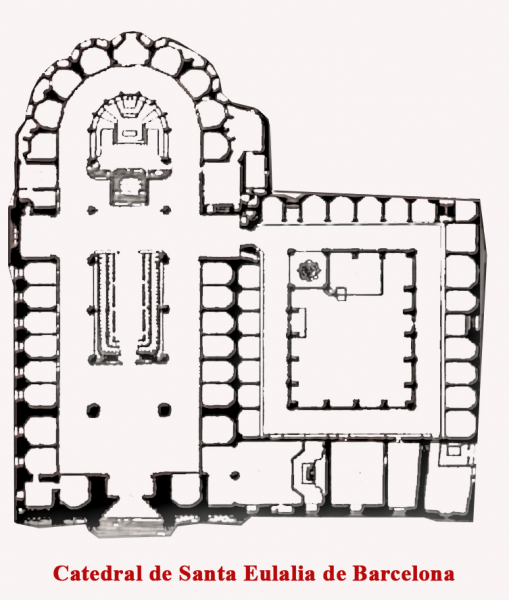 In 1298, Jaume II began the current model. The façade of La Seu provides a fine backdrop to the sardanes danced here at noon on Sunday, even if it doesn’t look quite right for such a venerable church— it was only begun in 1882, financed by a big-time banker, and vaguely following the original plans of 1408 by a French master named Charles Galtés. Although it has little to do with the Catalan style, it’s not as bad as some of the 19th-century façades pasted on other Gothic cathedrals. It nearly got something completely different: during a moment of power in 1820, anticlerical liberals proposed engraving the blank walls with the Catalan Constitution and Civil Code. The first parts built were the right transept, in 1298, and the Portal of Sant Iu (St Ives; the door leading into C/ des Comtes); the carvings up on the left show St George and Barcelona’s first count, Wilfred the Hairy, fighting a dragon and griffon respectively. Originally, a bridge over C/ des Comtes allowed the count-kings to go to Mass without rubbing elbows with their subjects. Inside, La Seu is Catalan Gothic at its most lavish and grandiose. It has only three aisles, but the architects managed to make it look like five. One of the few churches in Barcelona to escape the Anarchist firebugs, the interior is rich and atmospheric with a thousand details. The first chapel on the right, the star-vaulted sala capitular, contains the lucky crucifix borne by Don Juan on the mast of his flagship at the Battle of Lepanto, the great 1571 victory that kept the Turks from gaining control of the Mediterranean; the twist in Christ’s body came about, they say, when it dodged a Turkish cannon-ball. Underneath lies Pere Sanglada’s effigy of St Olegario (d. 1137), Bishop of Barcelona and advisor to the counts; his body lies below like Sleeping Beauty, in remarkably good nick after 860 years. The adjacent baptistry has a plaque that records the baptism here of the first six native Americans, brought over by Columbus, in 1493; its beautiful stained-glass scene of the Noli me Tangere is based on drawings by Bartolomé Bermejo. As is typical in Spanish cathedrals, the choir *(adm) is enclosed in the middle of the nave, behind a beautiful Renaissance screen by Bartolomé Ordóñez. The richly sculpted stalls of the 14th to 15th century were given fancy canopies in 1514, and painted with the arms of the kings of France, Portugal, Poland, Hungary, Denmark and England. When Charles V became emperor, he summoned them all as Knights of the Golden Fleece to Barcelona, a summit meeting that never came off—soon all of them were plunged into war. Henry VIII’s seat (he couldn't make it) is directly on the emperor’s right. Hunting and other profane scenes decorated the lower parts of the stalls, and the fanciest carving of all, by Pere Sanglada, is on the pulpit (1403). The choir faces the entrance to the crypt. Designed by the Mallorcan Jaume Fabre, who was in charge of the cathedral works from 1317 to 1339, its daring shallow vault is held in place by an enormous keystone. The crypt holds the relics of the co-patroness of Barcelona, Santa Eulàlia, who lies in a beautiful 14th-century alabaster sarcophagus, attributed to Pisan sculptor Lupo de Francesco, a follower of Giovanni Pisano. The story goes that Eulàlia, the Christian daughter of a merchant of Sarrià, threw dirt on the altar of Augustus and refused to worship Rome’s gods, and the scenes on her tomb show the 13 grisly trials designed to change her mind, including being thrown naked into a vat of starving fleas, and an attempted seduction by the handsome son of the Roman commander. Nothing could sway her, so her torturers lopped off her breasts and crucified her. Thirteen, her age when all this happened, is Eulàlia’s special number: to gain her protection at sea, a mariner was obliged to visit her tomb 13 Fridays in a row. After the virtuoso crypt, the altar is an anticlimax, supported on two Visigothic capitals, with a bland bronze Crucifix by Frederic Marés behind. To the right of this, the founders of the Romanesque cathedral, Ramón Berenguer I and his wife Almodis, lie in the painted, velvet-covered wooden sarcophagi against the wall. The door here leads into the sacristy and the treasury tucked behind (rarely open); holding pride of place is a late 14th-century gold and silver gem-encrusted monstrance, in the form of the throne of Martí I, with a tower and royal crowns, along with a silver-plated processional cross by Francesc Villardel, of 1383. Of the chapels radiating from the ambulatory, the fourth one on the right, dedicated to Sant Joan Baptista i Sant Josep, has the best art: the restored and minutely detailed altarpiece of the Transfiguration by Bernat Martorell (1450). On the far left side of the ambulatory you’ll find the lift to the roof with grand views over Barcelona (adm €3). What people tend to remember most fondly about the cathedral is the cloister, a charming green oasis of palms and splashing fountains, Begun in 1385, its iron-grilled chapels were once dedicated to the patron saints of Barcelona’s guilds (‘Our Lady of Electricity’ is still going strong) and many leading guild masters are buried in the floor; the capitals are covered with intricate carvings although they’re hard to make out. Another chapel commemorates the hundreds of priests, monks and nuns murdered in the Civil War. 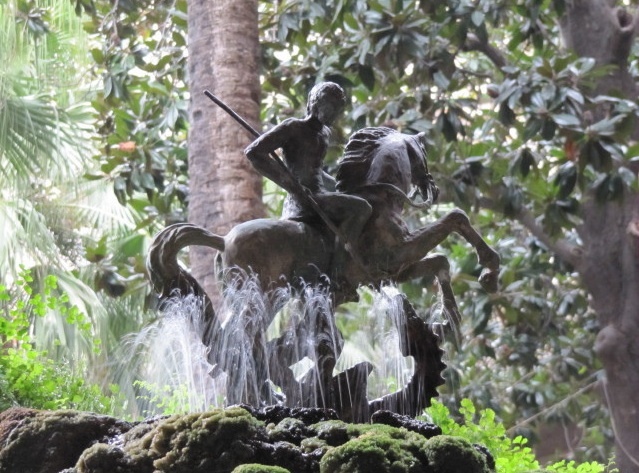 A pretty pavilion holds the Fountain of Sant Jordi, with a figure of St George rising from a mossy green blob. At Corpus Christi – until the 19th century, the biggest holiday in Barcelona, when guilds competed to make the most elaborate or alarming floats – flowers are wound around the fountain and a hollow egg is set to dance in the jet of water (l’ou com balla). Nor does anyone have to look far for an egg, because thirteen white geese natter away next to the fountain, with their little houses and pond. They have been there since anyone can remember, symbols of Santa Eulàlia’s virginity, or a memory of the geese that saved Rome, or (most likely) just because. Note the Romanesque doorway that leads back into the church, the only surviving bit of Ramón Berenguer I’s cathedral, cobbled together out of ancient Roman stones and capitals. This chapel in the cloister houses retired retables and reliquaries. The Pietà (1490) by Bartolomé Bermejo is his masterpiece and one of the first oil paintings in Spain. There’s a beautiful altarpiece by Jaume Huguet, painted for the guild of the Esparto workers, and organ cabinet door paintings (1560) by a Greek painter, Pere Pau Serafí, named ‘Peter of the Seven Ps’ for his Peter Piper business slogan: ‘Pere Pau pinta portes per poc preu’ (‘Peter Paul paints doors at bargain prices’). But don't scoot off quite yet—there's plenty to see around the Cathedral as well.